GDDR5X Assertion IP provides an efficient and smart way to verify the GDDR5X designs quickly without a testbench. 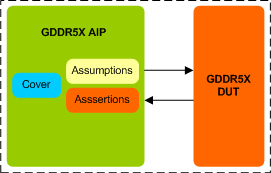 The SmartDV's GDDR5X Assertion IP is fully compliant with standard GDDR5X Specification. Supports for Auto & self refresh modes. Supports Protocol Checker fully compliant with GDDR5X Specification JESD232 and JESD232A compliants. Supports Simulation mode (stimulus from SmartDV GDDR5X VIP) and Formal mode (stimulus from Formal tool). Rich set of parameters to configure GDDR5X AIP functionality. SmartDV's GDDR5X Assertion env contains following.